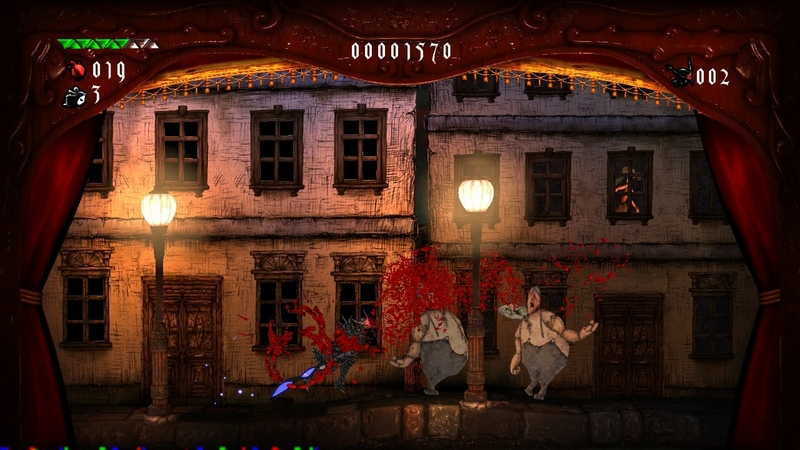 2D platformers have come a long way in the past decade, with titles like New Super Mario Bros. and Rayman Origins redefining what we should expect from the genre. Co-developed by Grasshopper Manufacture and Digital Reality, Black Knight Sword takes things in the opposite direction, with simple yet often difficult gameplay, and a story that is practically nonexistent. Unfortunately, the nostalgia the downloadable game is clearly trying to evoke is overpowered by the frustration you'll experience at every turn. From the moment you start the game, it's clear Grasshopper Manufacture - led by Goichi Suda, or Suda 51, as he is better known - has really gone all out in creating an atmosphere of absurdity. 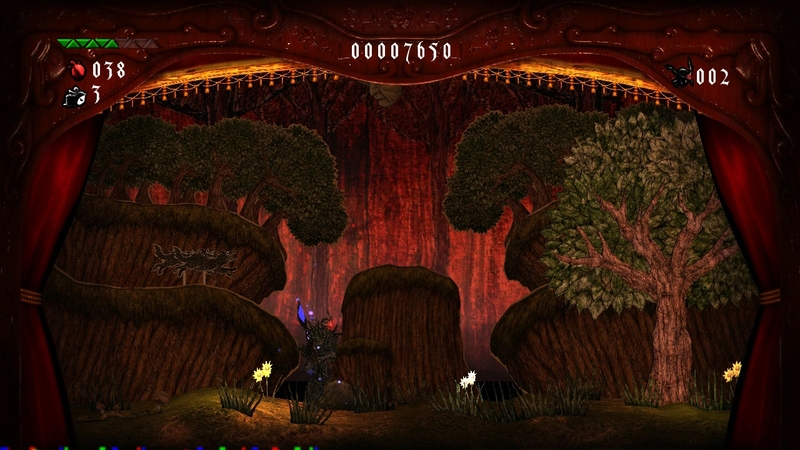 The entire platforming experience is presented like a twisted theater performance, complete with hand-drawn backdrops and props, and red curtains framing the sides of the gameplay area at all times. 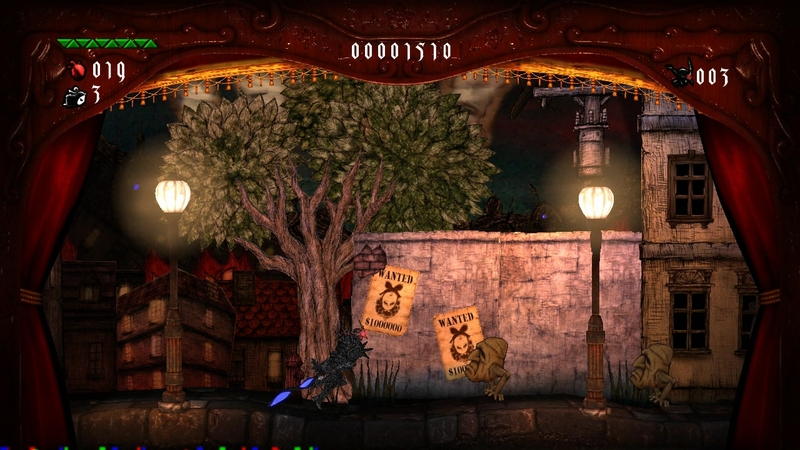 You begin the game as an apparent suicide, struggling to free yourself from a noose. Once you land on your feet, you are given a suit of armor and a powerful sword by a tiny spirit who becomes your companion. However, this somewhat serious tone is quickly shattered as soon as you see the first of hundreds of enemies you'll be asked to dispatch. Faces. Hundreds of faces. Sure, there are a few other enemy types, ranging from deadly flower blossoms to what appears to be an obnoxious chess piece possessed by the devil, but above all you'll be slashing grotesque heads left and right. Suda 51's insistence in Black Knight Sword repeatedly bringing back the same enemy type grows very old very quickly. After you've slain the same handful of baddies the 500th time, you'll wonder why you're still playing. What's more, the game manages to break one of the cardinal rules of platform titles: Some enemies will randomly abandon their established attack patterns with no warning whatsoever. Oh, you're relying on that tan-colored floating head monster to move up and down as it goes across the screen, just like the dozens of identical enemies you've just slain? Wrong! This one will come from below in a diagonal pattern for absolutely no reason... Surprise! Besting the cookie cutter bad guys nets you hearts which you can use to upgrade stats like health and damage at various shops you'll find throughout the journey. Sorry, did I say "shops?" What I meant was "flying eyeballs with hands for wings, held in cages which are supported by a single severed human leg." Silly me, I always get those confused. 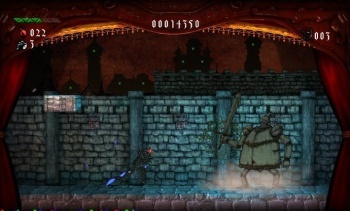 Like the standard cannon fodder enemies, the boss characters are fond of repetition as well. 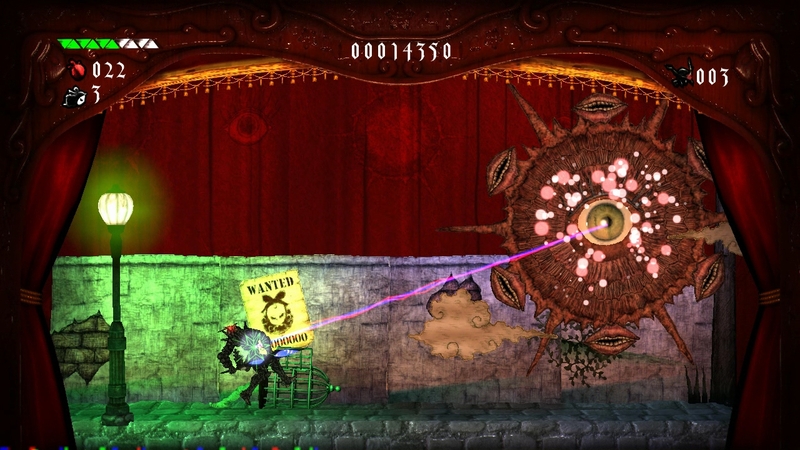 You'll fight each boss, and then you'll fight each boss again before embarking on the final level. This might be OK, and it even reminded me a bit of the early Mega Man titles, but when the entire game consists of a handful of relatively brief outings, it's easy to be frustrated by having to take out the boss you just got done fighting. 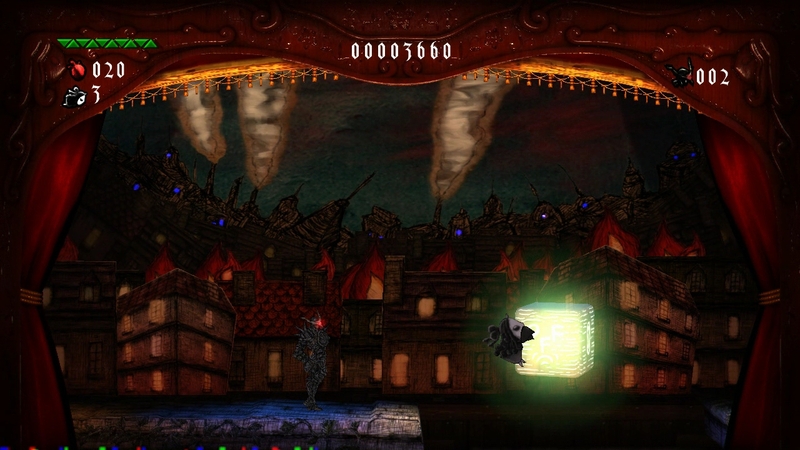 The levels themselves are just as ridiculous as the enemies, and while the game begins in a dark, mysterious town, you'll quickly be transported to venues like underground caves and even a Wild West locale. The story doesn't even attempt to give you an idea of why you're venturing to each of these settings, and random objects in the game world seem to have no correlation to either the level itself, your bloody task at hand, or the cryptic story sequences offered between levels. Put simply: Nothing fits. Despite all these gripes, the hacking and slashing you'll engage in for the few hours it'll take you to complete the game is at least marginally enjoyable. You gain additional attack options after besting each stage, and each upgrade offers a satisfying feeling that your knight is indeed more deadly than he was previously. Taking out multiple enemies at once with a well-timed, charged-up slash attack feels good, even if it's only because you're tired of seeing the same enemies for the 5th level in a row. like a patchwork of strange dreams, mediocre ideas, and sub-par game design. Bottom Line: Black Knight Sword isn't particularly good at anything it sets out to do. Moments of gorgeous art design are offset by shamelessly cloned enemies and pointlessly confusing dialogue. The game is clearly doing everything it can to be different, but it appears more time was spent making the game weird than making it a cohesive experience. Recommendation: It's hard to recommend Black Knight Sword to anyone but the most hopelessly devoted platforming fans. If the game initially caught your eye because Grasshopper Manufacture was involved in its development, I can safely say that this is not the studio's best work.